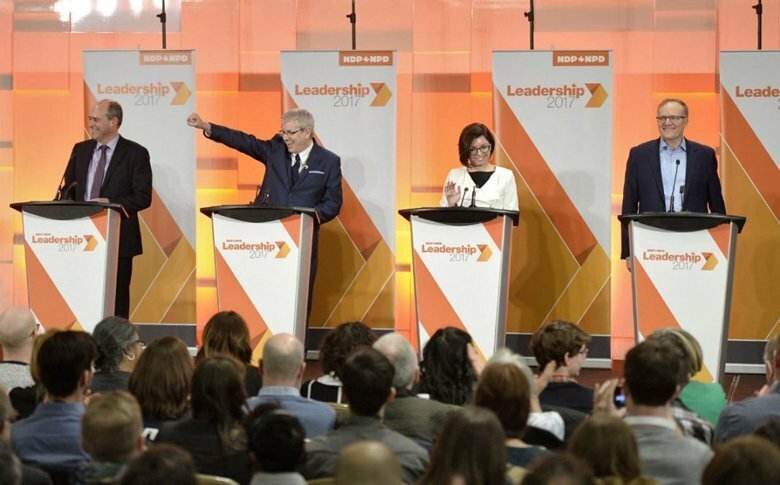 I was excited to watch the first Federal NDP leadership debate on March 11. Four candidates have so far entered the race, including Niki Ashton of Manitoba, Peter Julian of British Columbia, Charlie Angus of Ontario and Guy Caron of Quebec. Do they sound confident and prepared? Do they communicate clearly and relate to the audience? Do they have a good grasp of the issues? Are they focused on the topic in hand? Can they think on their feet? Do they appear decisive? Do they seem honest and trustworthy? Are they willing to be held accountable? The debate was fast and furious, switching swiftly from English to French and back again. All the candidates made brief opening speeches, then responded to a couple of questions in each language, then answered light-hearted rapid-fire questions about themselves. Then more serious questions in both languages and the chance to debate two on two. This gave lots of opportunity to learn about the candidates themselves and the variations in format were refreshing. The robotic voice of Michael Serapio, the male translator, was somewhat disconcerting however, as although his command of language was excellent, he could not bring to life the differences in the personalities of the four candidates. All four candidates had years of experience in the House. All were eloquent in both official languages. They generally communicated clearly and seemed well prepared. At this stage, they all had a grasp of different issues and no-one wanted to reveal their hand on future policy. They were not much challenged to think on their feet, though all four managed to work in their preferred points very neatly. All four seemed honest and willing to be accountable. None appeared particularly decisive. I think they each have a vision for Canada. This will become clearer as the debates progress. So far each one is eminently “electable”. Julian is against Energy East and Kinder Morgan. He wants to find ways to develop renewables. Caron pointed out that although both Conservatives and Liberals have talked about it, there has been no green energy plan in the past ten years. This is an opportunity for real economic growth. Charlie Angus mentioned putting an end to post-secondary tuition fees. Caron is a firm proponent of a Basic Income policy, but says it will be complicated to implement. Peter Julian pointed out that we will need a heavy hitter in NAFTA talks with the Trump administration, to defend Canada’s interests. Niki Ashton wants the party to move left, back to our roots, and to rebuild the NDP by reconnecting with youth and with the ridings. The candidates agreed that it was important to win back support in Quebec, by speaking French and listening to activists. Niki Ashton talked of “asymmetrical federalism.” She would contact students, women’s groups and environmental groups. It is important to be specific about the causes we are working for. They all saw a pressing need to reduce inequality. Caron explained that we will introduce a basic income for “the right reasons,” not solely to facilitate laying off thousands of workers. 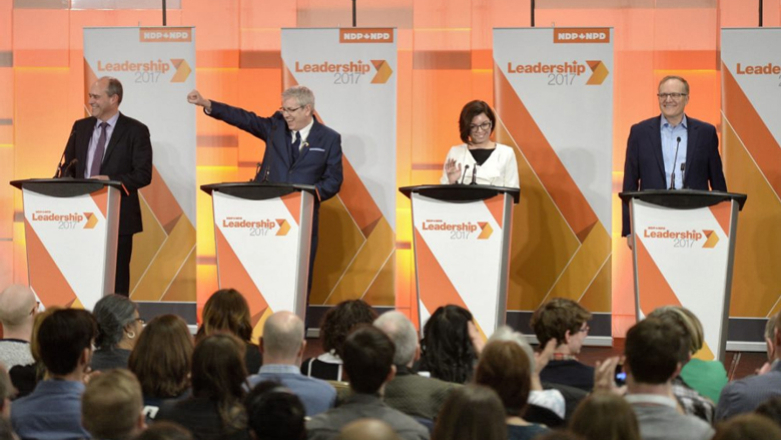 The candidates asked, if the Liberals are “out-lefting” the NDP, where’s the plan to reduce student debt, introduce affordable housing, improve the economy? Questions on tax reform produced agreement that we need a plan and leadership, but no tangible proposals at this juncture. Overall the four agreed about “motherhood” issues, the social justice concerns that are the foundation of NDP policy. They agreed with each other in a friendly and businesslike way, but so early in the campaign, they were not giving much away in terms of their own policy proposals, although growing the green economy was a popular idea with all four. Peter Julian said Courage and Boldness. History shows that the NDP always takes the next step. 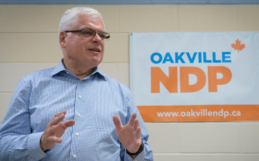 Charlie Angus said the NDP has your back in tough times. N is for New and modernised, D is for Developing an engaged and inclusive movement, P is for Party where we put fun back into policy making. Niki said Principles. The Liberals talked about “Real Change” but where is it? The NDP is a party with a passion for justice. 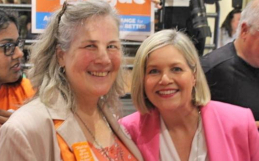 Caron said in the NDP, we say what we mean and we mean what we say. The NDP will give you the real thing. These four candidates looked like a strong and competent team. In this first debate, none stood out as a natural leader, but there are many more debates, and perhaps additional candidates, to come!